The Packers' script for success has been flipped a bit the last two weeks, with a staunch defense setting the tone and an offense that looks, at times, fairly ordinary. GREEN BAY — Only with the Green Bay Packers could there be consternation about an offense for a team off to a 5-0 start and averaging 27 points a game. But expectations are high when Aaron Rodgers is the quarterback and the scheme belongs to offense-minded coach Mike McCarthy. Following two sluggish weeks — at least by the Packers’ standards — Green Bay is determined to improve when the San Diego Chargers come to Titletown this weekend. "Monday was a little rough in that room," McCarthy said, referring to meetings this week with Rodgers and the offense. "It was healthy, though." Green Bay has hit a speed bump in scoring four offensive touchdowns and two field goals over the last two weeks. The running game struggled in the 24-10 win over the St. Louis Rams, who stacked the box and covered receivers on short routes. This is an area where top wideout Jordy Nelson might be missed the most after being lost for the year in the preseason with a torn right ACL. The Packers don’t have an option to replace the deep threat presented by Nelson, though Rodgers has said Davante Adams might be able to fill the role when he returns from a left ankle injury. 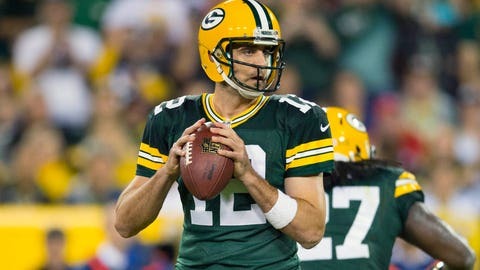 "I think it’s going to take being more efficient in the passing game and challenging some people down the field a little bit more," Rodgers said Wednesday. It’s the opposite of the 2011 season, Rodgers noted, when the Packers averaged 35 points a game with a diverse passing attack. Last week, the Rams focused on stopping what was then a third-ranked running game. Safeties came up more in run support, and receivers were left in man coverage. The normally mistake-free Rodgers threw two interceptions, one on a tipped pass and another when a defensive back jumped a short route. "I think it’s going to take us making some plays outside the numbers to soften things up a little bit for us," he said. Make no mistake, though, Rodgers is satisfied with the unbeaten start. "I think he’s a lot like some of the guys on offense. You’re happy you win. It’s important to make sure we all understand that," McCarthy said. "He’s looking forward to adjusting and being creative, as we like to think we are on offense, and get ready for" the Chargers. The Packers’ script for success has been flipped a bit the last two weeks, with a staunch defense setting the tone. The pass rush is nearly unstoppable with an NFC-high 20 sacks. Against the Rams, the secondary got in on the fun by picking off quarterback Nick Foles four times. "It’s really fun," tight end Richard Rodgers said. "The fans like seeing offense, scoring and everything. I think as football players, you really like to see the defense succeed." It has given the offense a cushion to get jumpstarted. Getting healthy across the offense would help, too. Adams returned to practice Wednesday on a limited basis after missing two games. Fellow receiver Randall Cobb was a full participant for the first time in two weeks as he plays through a nagging shoulder injury. Guard T.J. Lang expects to play Sunday with a brace on his right knee after being forced to leave the Rams game in the second quarter. In the film room, coaches are harping on cleaning up small mistakes and focusing on fundamentals. "We are 5-0, that’s obviously a positive and we’re looking for positives. We’ve just got to work on the little things," Richard Rodgers said. NOTES: Safety Morgan Burnett (calf) was limited in practice after missing the last three weeks. … Defensive tackle B.J. Raji (groin) and linebacker Nick Perry (shoulder/hand) missed practice. McCarthy sounded the least optimistic about Perry’s chances to play Sunday.